“Can you give me statement regarding each of the pictures in which Mr. Laurel has a participation? “I hate to bother you so much about the matter or about information in regard to the statements that you have given me and, while I know that you have been extremely considerate about the matter, especially in view of the mountainous work resting upon your shoulders, I wonder whether you would prefer that the United Artists be instructed to send us this information from time to time. 1/26/23 - Letter/agreement - original &/unsigned copy. Hal E. Roach Studios & Stan Laurel. 12 weeks employment beginning 1/29/23. 1 year further @ $400 per week. 1 year additional @ 1500 per week. 1 additional year @ $600 per week. 1 additional year @ $700 per week. 1 additional year @ $800 per week. Salary subject to adjustment at time of renewals - per letter of 3/2/23. 12-l/2% of total net profit of release of films under contract. Payments subject to subsequent correction or adjustment when success or failure of pictures as a WHOLE can be ascertained. 12/12/23 - Agreement - original & unsigned copy. Hal E. Roach Studios & Stanley Laurel. 1. Report by Acceptable CPA shall determine net profits. 2/8/24 - Agreement - original. CANCELS & TERMINATES CONTRACT OF 3/2/23 EXCEPT Participation clause. Under 3/2/23 contract, “12-1/2% of total net profit derived from release of films” is payable to Laurel. No time limit is set in the contract as to when Laurel shall cease participating. It is possible that Laurel may participate indefinitely in all net profits resulting from any type of release of the films. 11/29/26 - Agreement - original & unsigned copy. Employment of Laurel as actor & writer of stories & scenarios. 5 years - 4/4/27 to 4/3/32. Salary only. 10/11/27 - Letter - 2 copies, 1 signed. Hal E. Roach Studios to Stan Laurel. Salary as star under 11/29/26 agreement. 9/16/29 - Letter - signed copy. Hal Roach Studios to Metro Goldwyn-Mayer Studios. 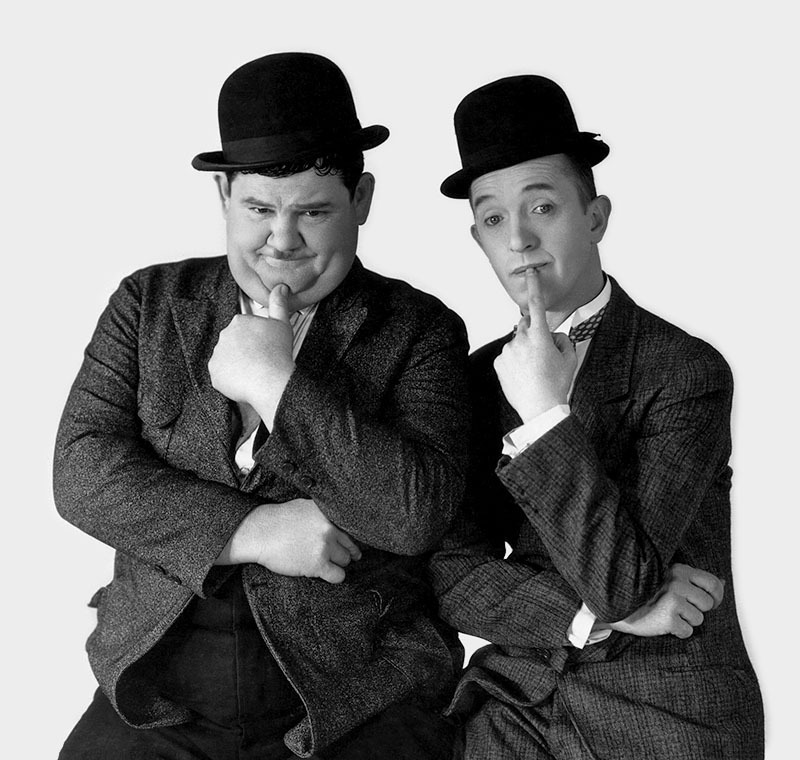 Services of Laurel & Hardy for Metro in THE ROGUE’S SONG. 11/20/29 - Letter - original. Stan Laurel to Hal Roach Studios. Suspension of of contract during personal appearance tour - 11/21/29 to 11/28/29. This agreement is presumably superseded by agreement dated 11/7/30, although we do not find any modification or termination agreements. 1/7/30 - Agreement - original & signed copy. Hal Roach Studios, Inc. & Stan Laurel. Employment of Laurel as actor, director & writer. 5 years - 12/23/29 - 12/22/34. Salary only. 1/5/32 - Agreement - signed copy. Metro-Goldwyn-Mayer Distributing Corporation and Hal Roach Studios, Inc.
Distribution of Laurel & Hardy feature to be delivered to Metro by 6/15/32. (See Metro contract file for detailed abstract. This document has to do only with Roach & Metro.) Contract to be filed with other Metro distribution agreements. 6/29/32 (Pencil Note) - Letter - Original & unsigned copy. Hal each Studios to Stan Laurel. Suspension of 1/7/30 contract for 60 days. 12/12/32 - Letter - 2 signed copies. Hal Roach Studios to Stan Laurel. Provides contract of 1/7/30 will not extend for additional 2 months beyond 12/22/34 as result of 6/29/32 suspension. 12/12/32 - Modification Agreement - 2 signed copies. Hal Roach Studios & Stan Laurel. Modified contract of 1/7/30 as to minimum working period, salary & cancellation clauses, for year 12/23/32 to 12/22/33. 3/16/33 - Letter - 2 signed copies. Modification of 1/7/30 contract re salary for period 3/6/33 thru 3/2?/33. 4/17/33 - Letter - original & signed copy. Laurel & Hardy’s share of receipts on commercial tie-ups from 4/17/33 to 12/23/35. 7/22/33 - Agreement - signed copy & conformed copy. Payment of Laurel’s compensation under contract of 11/7/29 to Calif. Trust. REFERS TO CONTRACT dated 11/7/29 and modification agreement of 6/24/32. 9/21/33 & 9/22/33 - Letters- signed copy & original. Services of Laurel & Hardy in “Hollywood Party”. 1/4/34 - Letter - original. Requests termination of 1/7/30 contract. 1/24/34 - Letter - 2 signed copies. Permits suspension of contract account ill health or Laurel. Performance of contract to be resumed upon Laurel's recovery. 3/8/34 - Letter - Original and signed copy. Permits Laurel to complete work on Metro picture. 5/7/34 - Agreement - signed copy. Stan & Lois Laurel, Hal Roach Studios Inc. & California Trust. Cancels trust agreement of 7/22/33 and authorizes payment of Laurel’s compensation under contract of 1/7/30 direct to S. & L. Laurel 50-50. 6/13/34 - Letter - original. Stan Laurel & Hal Roach Studios. Resumption of performance of contract dated 1/7/30. 3/14/35 - Letter - signed copy. 3/28/35 - Letter - original. States contract does not expire until 5/7/35 & he is willing to perform services required until that date. 4/10/35 - Letter - two signed copies. 4/18/35 - Letter - original. Letters stipulate 1/7/30 contract expires as of 4/13/35 as to payments to Lois Laurel. 4/8/35 - Agreement - original. 1. Contract of 1/7/30 is fully performed as of 4/7/35. 2. 1 Feature & 1 two reel short to be made under terms of 1/7/30 contract, although expired; salary to be $3500 per week. 1 year from date of completion of pix in #2 above. No. of Pix: 6 four reelers or equivalent. $30,000 each for 4 reelers. $65,000 for each subsequent feature. 5/27/36 - Letter - original. States work on story in progress for last picture to be made under contract of 4/B/35, and that picture will be completed after 7/22/36. 10/10/36 - Letter - original & signed copy. 1/6/37 - Letter - 2 signed copies. 1 conformed copy. Laurel agrees to appear in Pick A Star for total salary of $10,000.00. 10/8/37 - Original & signed copy. Hal Roach Studios & Stan Laurel Productions, Inc.
Employment for 2 years from 10/8/37. $2500 per week during working time & $25,000 per picture - to be paid to S.L. Productions, Inc.
$5000 completion bonus to be paid Laurel on each pic. (See copy of answer/by Hal Roach Studios, Inc., defendant to Stan Laurel & Stan Laurel Productions, Inc. plaintiffs). No copy of notice of termination on file. 4/8/39 - Release Agreement - signed copy. 1. Contract of 10/8/37 cancelled. 3. Settlement: $5000 paid to Laurel & note for $35,000 given him.